This is an exquisite digitally printed 'aquaflora' design on a medium-light weight linen that has lovely drape with body. 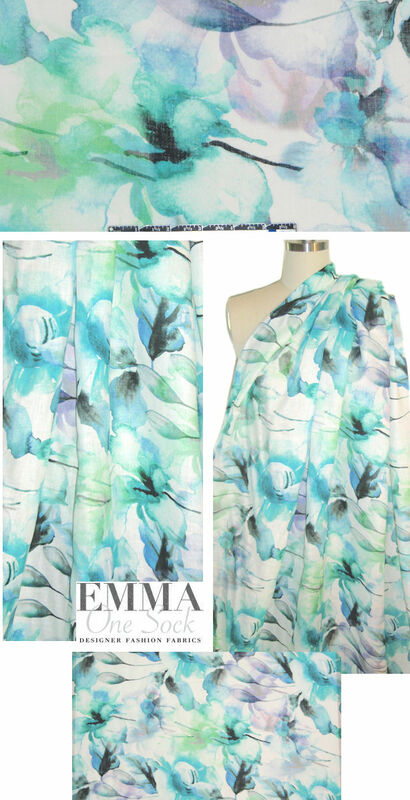 It's a stunning abstract watercolor floral print in mixy shades of aqua, blue, lavender, lime, etc. on a soft white ground (PANTONE 16-5127, 14-6330, 16-4132, 15-3817, etc.). The weight is very versatile, suitable for a skirt, dress, shirt, tunic, etc. Dry cleaning recommended by the manufacturer, but we've put many of these linen prints in the washer and dryer and they came out just fine.